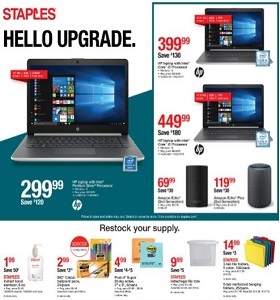 Staples Weekly Ad February 10 - February 16, 2019. Hello Upgrade! Staples Weekly Ad February 10 – February 16, 2019. Hello Upgrade! -$69.99 Adobe Photoshop Elements 2019; $279.99 Brother INKvestment Tank color wireless inkjet all-in-one. To see the weekly circular for your favorite Staples store, search by ZIP Code or city, state.